Praise the Lord for the opportunity we all have to serve our Lord and Savior, Jesus Christ. 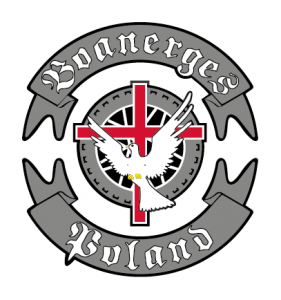 We count it a privilege to be able to serve in Poland. Thank you for praying for us and with us, as His name is shared to many. 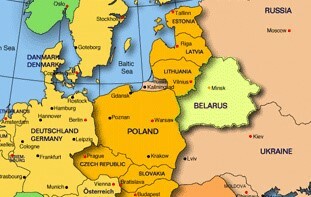 The Lord sent a Messianic Jewish group here for over a week from Belarus. Camp Chalutzim sponsored by Reach Initiative International. What a blessing to have them here and to see the Joy of the Lord flowing out of each of them! They do not have freedom of religion like we do…but they are still on fire for the Lord and know how to praise Him. They said that the camp is the highlight of the year for them. One of the leaders shared different testimonies of how the Lord worked in so many of the youths lives during their time here at Elim. Another youth had experienced paper/document problems at the border and the border guards had wanted to take him off the bus. Everyone prayed that the authorities would allow him to cross into Poland. In a total of 40 minutes the proper papers were faxed and mailed to the border guards and he was allowed to cross (NOTE- it took many months to get the visas approved for this group)! This young man was dancing and singing with joy! One teen’s parents had divorced and she had come to camp with a strong fear of not being able to have a normal family because of the betrayal and fears from her parent’s divorce. At camp the Lord set her free from this fear and gave her true peace that, it will be possible for her to have a godly family of her own one day! Dancing in the Mission’s courtyard. Around 70 young people from various parts of Poland attended this year’s ‘Discipleship Training Camp’. During the afternoons they went into the local town to share God’s love with people – praying for the sick, playing games with the children, reaching out to the poor – all the while strengthening their own love and passion for the Lord Jesus Christ. 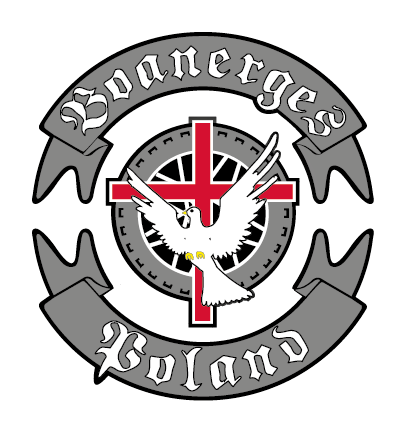 Poland has an active Christian Motorcycle group that is vigorously involved in evangelism of all sorts all around Poland. This year the Lord sent 50 of its members to Elim for their retreat and into our local town for really effective outreach for His Kingdom. It’s great to see how God uses so many ministries in such unique ways! The ‘Hearts For Elim’ women (from American military communities in Germany) came to the Mission recently for a small-scale Medical Clinic over a two day period of time. People were invited to the clinic that live in spiritual hopelessness and emptiness, so for the medical team it was a God-given time, not only to give medical aid, but also to share the wonderful Gospel of Jesus with them. Please pray, as we seek ongoing ministry to these people. God also used the “Hearts for Elim” women to bring the Gospel to the dying in a poorer Hospice. After putting together Polish scriptures in beautiful frames on the first day, we were able to deliver them on the next day, as well as make bedside visits to each patient. It was a real time of hope for people in despair, with some of them committing their lives to Christ. We returned to the Hospice a few weeks later, and many who had received Christ on the day of that visit, had already passed into eternity. Oh- the opportunities that come and go; may God lead us all, that we would have His heart. One man with cancer at the hospice had not been able to talk for 3 years. When pastor Tomek entered the room and shared Christ with him, he began to talk, and held a wonderful conversation with him. As others heard this sick man talk, they realized that something amazing had happened! God used this in a very real way. Please pray for God’s wisdom for ministry there, and that many will respond to the call the Lord Jesus Christ. God has also blessed us all through the many others who have come this year on variety of other camps, retreats, ministries and individual guests, -from Poland, Holland, Germany and other. Thank you Lord for each one! Once again God let us use the big truck as a platform to sing His praises through the town, surrounded by thousands of people, down the main street. It was a God-given opportunity to hand out tracts of hope for the adults, and V.B.S. invitations for the kids and teens. While face painting, we were given a 2 hour spot on the stage to run a Christian program. It’s God’s grace that the town leaders invite the input of the church and the Mission, and we pray that God keeps these doors open. During this year’s Summer VBS we felt a special blessing over the whole program, although we cannot pin-point any one specific. Many of the parents joined into all the activities as though it was as much for their own growth in faith, as it was for their children. The follow-up ‘Mini-VBS’, which runs weekly, also seems to have a special atmosphere. 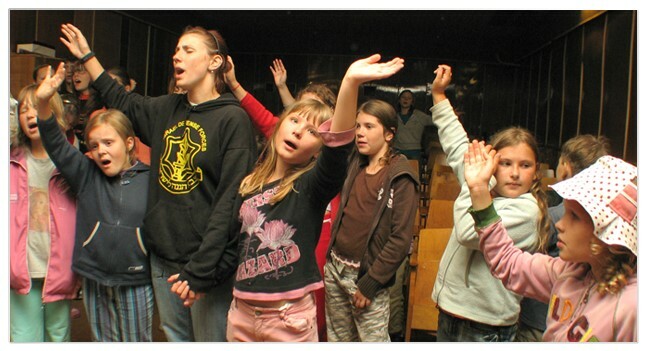 We pray for changed lives, in the young and the old, as this year progresses with VBS. At Elim, God continues to care for the needy, children and the elderly by feeding them daily during the week. He has continued to provide food, and we see His kindness that gives opportunities to reach these people with His wonderful message of love. Praise the Lord for His faithful provisioning of food for this purpose!! The clothing room continues to be held at the Mission, (although there have been plans for a few years to move it into the local town.) Meanwhile, the Clothing Room provides a great opportunity for ongoing contact and opportunities into the lives of so many families around us. The local government also works along side of Elim, sending it’s most needy families to the Mission for various kinds of needs,. God has been so faithful in keeping the room filled with clothes & giving opportunity to share God’s hope in Jesus! We praise God for this!! Gosia Zdunska, one of the church’s young people, has recently returned after 2 blessed years of service with Operation Mobilization on the Logos Ship. Gosia is from a small village whose family first came into contact with Elim through the Clothing Program. After she became a Christian she later completed 2 years of Bible Schooling in Poland with Christ for the Nations; she then took a big step in faith the serve another 2 years with OM. Another 2 young people from Bethel Church, Agata and Patrick, have recently left Poland to serve the Lord in Spain for 10 months. We pray for God blessing and life growth for these willing young people. Since Poland joined the E.U., there are many new laws that directly affect the running of the Mission. Because we are a public outreach center offering camps and accommodation, we are now required by law to make some major changes. Although the new laws prevent us now from having organized Camps, we need to welcome the proposed changes, as they will ensure the safety of all the precious people coming onto the Mission land. The Head leaders of the Heritage Commission, the Fire Department, and Building Authority did an inspection of the Mission property. In short, we have been given a list of things that we need to do to protect organized camps using the mission property. A complete fire-monitoring system that needs to be in every room and corridor which connects to the local fire department. Multiple fire-hose-reels on every floor. These require specific plans and installation, having to meet the precise requirements of the Heritage Commission. Fireproof doors placed at various locations to provide a safe fire exit from all points. Special fireproof windows to be installed in the Main stairwell, which serves as the main fire escape. Upgrade of the kitchen facility to meet the new requirements for health and safety. A few smaller items to fit within the requirements for building code, health authority and fire and safety. This is very important, as the safety of campers is paramount. We were informed that if a death occurred because of a fire, without the Mission having all this in place, the Mission leaders will be charged and imprisoned for manslaughter. May the Lord give His grace that no life will be lost, at the same time we need to respond with obedience to the new laws that bring safety to our campers. Please pray with us as we seek to get all this done as soon as possible. All the work is very detailed, and we have been told that it can only be done by ‘approved’ Companies. We need God’s wisdom as on to how to progress. Please pray with us! The last 23 years have been wonderful as we have seen the Lord provide the strength, people and the provisioning to get the Mission to the stage it is now. Praise Him for His Faithfulness! We do believe also that He has a plan for this next stage, and we are praying sincerely for His wisdom and His direction. We do so much need Him!! Thank you so very much for sharing with us in prayer at this time. We do appreciate you all. Pray for another cook to relieve Lydka in the Kitchen. Prayer for staff health. Marian and Ken – back problems, Lydka – eye sight and internal health issues, Malgosia – Kidney and other health problems. Please pray for Joshua (Pawel and Judy’s son) for wisdom for their family concerning his public education. Joshua is Autistic and requires personalized/special teaching time. Prayer for Julia (Robert and Aneta’s daughter) and Rachel (Pawel and Judy’s daughter) for their future education and which path to take in the years ahead. Recently someone posted a link to a video taken by a drone of the Elim mission. We do not know who took the video, but we wish to share it with you. If you wish to see the mission property from a bird’s eye view please click the link below.